The Nitto NT-555R Extreme Drag Tires are capable of providing up to 15,000 miles of driving use under ideal conditions. Impressive, right? Nitto NT-555R Extreme Drag Tires are manufactured with original tread depth of 6/32nd inch and are constructed with a specially formulated soft racing tread compound to provide maximum traction. However this soft and flexible tread will wear much quicker than tread compounds formulated for regular passenger car tires. Available in 14-17 inch sizes. Best all around Drag Radial out there! I have 305/35R18's on my CTS-V Wagon. Currently 735whp. With a soft launch (1.58 60 foot) I have run a best of 10.24 @ 136.4. I have not found any weakness as of yet! def not "extreme", worked great on my street car (96' trans am 6 speed ALOT of bolt ons w/ mild cam), not so well when bolted the same wheels/tires up to my 700 rwhp street/strip car with 3500rpm stall. Mickey T's are the real deal. Great traction, good in the rain 10-15K miles for a sticky tire is great! Great tire, these are the most streetable of the street legal drag tires. You should get 10-15K miles out of them compaired to 1-2K miles out of some of the other street legal drag tires. Tread wear - to be expected! Since I have a Vortech Supercharger on my 95 Trans-Am I was having trouble finding a tire that would stick to the road - well the Nitto 555R stepped up to the challenge - AWESOME tire! Once you heat them up they provide unparalelled traction on the drag strip. And best of all, you can drive to and from the track without changing tires. They dropped about 1/2 a second off of my e.t. You do have to heat them up or else they don't provide much added traction. They wear down fast, so I would never use them for daily drivers. And I broke both drive axles using them (combined with a Clutch Masters Stage-3 clutch) when I was at the track. Now that was embarassing. I paid $180 for the 14" radials. I recommend them for use when drag racing only. If you aren't a serious drag racer don't bother with them. But buyer beware that is is MUCH easier to snap axles when using these. If you plan on goin to the track with them, keep an extra set of drive axles next to your tool box. These babies grip! Stock tires... grip... what grip??? Unsurpassed dry traction with suprisingly good wet traction. 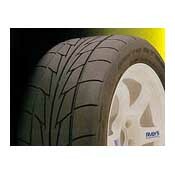 Super soft material wears quicker than normal radials, but after all it is a drag radial. Loses traction in standing water. I paid $240 for a pair. I would highly recommend these tires to anybody with a high-powered sports car that just can't get traction with regular radials.